I am emerging (briefly) from grad school hibernation–my husband jokes that I’m taking all my classes “pass/flail”–for a special cause that hits close to home, even though Jennifer Elliott, a dietitian who has been going the rounds with her various professional organizations and institutions, lives in Australia. She apparently had the gall to suggest to a patient with type 2 diabetes that a low-carbohydrate diet might be beneficial. Heavens. What is the world coming to? Next thing you know, people will start telling us that if we are allergic to poison ivy and it makes us itch all over, we might not want to roll in it. If you haven’t had a good eyeball roll or facepalm for the day, you should check out her blog, where she recounts one episode after another of Orwellian-level doublespeak with the Dietitian Association of Australia. It’s a situation I’m quite familiar with, albeit on a much smaller scale and with our homegrown Academy of Nutrition and Dietetics here in the US of A. Well, cue the Twilight Zone music, because we are going there. Enter “patient who could be my dad.” Let’s call him Mr. Louis Corbin (LC). He greets the dutiful dietitian (DD) who is determined to adhere to SNSW Health policies. DD: Hello, Mr. Corbin. How can I help you? LC: Well, I feel like I need to change up my diet a bit, and I’d like some help from a wise, caring, trained professional who will treat me like an individual and not like an aggregated average of a dataset. DD: (Laughs demurely.) Well, of course. As a trained professional, it’s my job to use my clinical judgment to help patients find out what works best for them. LC: Beauty! So, I was diagnosed with pre-diabetes about 10 year ago. DD: Really? Looking at your lab report, your blood sugar and HgA1c levels look perfectly normal. Tell me about the medications that you are using. LC: Well, I’m not actually on any medications. When I got my diagnosis yonks ago, I borrowed my cousin’s glucometer and figured out which foods were making my blood sugar go up. I really limit those in my diet now, and my blood sugar seems to be well under control. But I’m getting a little tired of eggs and sausage for brekky every morning. DD: Eggs and sausage? Is that it? LC: And some sautéed spinach or sliced tomatoes, most days. But I’m hoping you can help me with some other brekky ideas. DD: But they are a “low carbohydrate” fruit and so they don’t count. LC: … and I don’t eat bread or cereal–not even whole wheat. Those were the things that made my blood sugar go up! DD: Of course. We need your blood sugar to go up. You do know that your brain won’t work without glucose from healthy, whole grains, right? LC: My brain seems to be working fine. I finished “The Age” crossword puzzle while I was in the waiting room! DD: Well, it’s quite clear to me that your brain must not be working properly–you’ve put yourself in grave danger. You need AT LEAST 3 servings of carbohydrate per meal, and not just at breakfast I might add, in order for your body to function properly. LC: Three servings per meal! Crikey! That will make my blood sugars go up for sure! DD: Well, yes. As I said, your blood sugars need to go up. You see, Mr. LC. , in your addled state, you’ve failed to understand that diabetes is a PROGRESSIVE disease. And your diabetes hasn’t progressed at all. In fact, it seems to be quite stalled. LC: But, but, I don’t really want my diabetes to progress. DD: Nonsense. That’s what diabetes does. You’re deluding yourself if you think otherwise. I’ve seen hundreds of patients with type 2 diabetes, and I treat them all the same way–with the official Australian Diabetes Society diet–and they all have gotten progressively worse. So there. Yes, I understand that your diabetes hasn’t progressed in 10 years on a low carbohydrate diet, but it’s clear why that is. It’s good that you’ve come to me so we can reverse that trend. I can help you choose foods that will be sure to start you down the road to full-blown diabetes. LC: But I’m feeling bloody top notch. I’ve even lost a little weight since I started reducing my sugars and starches. DD: Oh dear. I didn’t realize that. You’ll really need to fill your plate with healthy whole grains so we can get some of that weight back on. You’re never going to end up on insulin at the rate you’re going. But no worries. If you can stick with at least 4 servings of carbs per meal, we might be able to get you on insulin in a few years or so. Once we’ve got you on a regular dose of insulin, you’ll keep packing the weight on, no problem. DD: No “buts.” Sir, you don’t realize the seriousness of this situation. It’s not just about the insulin. Not only do we have prescriptions that need prescribing and diabetes educators that need to educate, we have wound clinics that need wounds, dialysis clinics that need failing kidneys, testing laboratories that need labs to test. Have you any idea how many people you might put out of work by stalling your diabetes in its tracks? 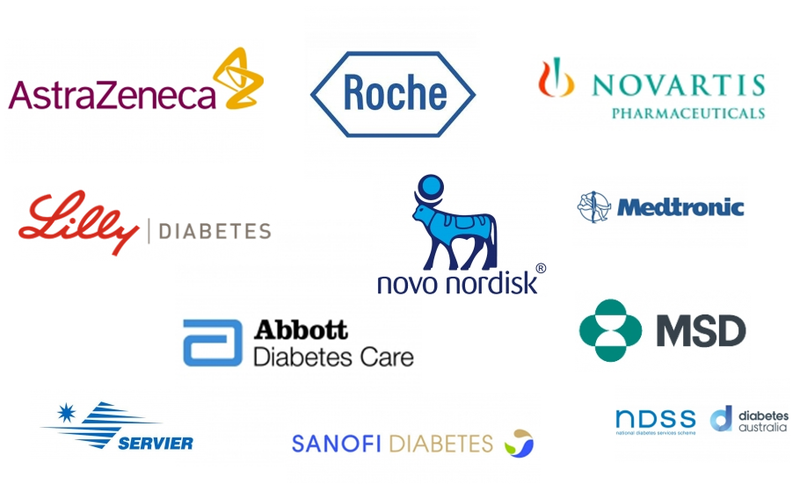 A “Who’s Who of pharmaceutical and medical supply companies”? Nah, just the sponsors of the last Australian Diabetes Society conference. DD (Continuing): You’ve not only put yourself in danger, you’ve endangered our whole healthcare supply economy! We have injections to make your blood sugar go down. We have glucose tablets to make your blood sugar go back up. We have monitors and supplies and diaries and trackers and coolers and carriers for all of the THINGS you will need when you have diabetes. We have diabetes foot cream, insoles, socks, and shoes. And wheelchairs for when your toes rot off–which I can assure you they will if you’ll only improve your diet. Then you’ll get to use the freight elevator and get one of those special parking passes. If you play your cards right and follow your diet as I prescribe it , you may even end up with one of those cute little scooters for getting around the grocery store. DD: Now then. Not to worry. You’re on the right path now. You wanted some brekky ideas? Here’s a low-fat, vegetarian recipe for blueberry hotcakes, with 46 grams of carbs. It’s from “Diabetes Australia,” so you know it’s perfect for someone with diabetes! It should get your blood sugar going for sure! And here’s some coupons from the Australian Breakfast Cereal Manufacturers. I picked up tons of them at my last dietitians conference–they’re working with us to make sure everyone has a healthy, whole grain, cereal product brekky EVERY DAY! DD: No “buts.” I’ll expect to see you back in about 6 months. We’ll get that HgA1c moving in the right direction this time and have you on the road to complete and total dependence on the health care system in no time! Bye now! What can you do besides resolve not to move to New South Wales anytime soon? Write a quickie email to the New South Wales Health Minister, Jillian Skinner, telling her about your experiences as a patient, clinician, family member in successfully managing type 2 diabetes/pre-diabetes/metabolic syndrome/etc. with a carbohydrate-reduced diet. If you are feeling particularly feisty, go to Jennifer’s blog and post your letter there too, to let her know you stand in solidarity with her. **And many thanks to Disco Stew who provided the authentic Australian translation of this conversation! When I wrote about this dilemma in the Daily Mail recently, the piece triggered over 200 responses from readers caught in this invidious position. Way to go, 21st century health care system. Sigh. As a yet more bizarre, yet still strangely typical sequel to their banning of low carb diet advice, the geniuses in the New South Wales government have just legalised eyeball tattooing. Brilliant. So much for protecting the health of the people. Thanks for sharing. Through work I had access to a dietitian coach that I would talk to on the phone to check on my progress. She was very hostile to the low carb diet I was on. I was eating about 60 to 100 carbs a day and felt fine and was losing weight. She was actually hostile to me eating so few carbs and wanted me to double or triple the amount of carbs (and calories) that I was eating. I had to stop dealing with her because she was making me angry for no reason. And although no one will be gauche enough to say it, I’m sure someone along this young man’s journey will briefly think “If only he’d eaten/not eaten this/that–he wouldn’t be here.” I wish your friend and his son the best. And, please, when people are in a hospital and not feeling like eating anyway, couldn’t we please feed them some real food? Chris, that sounds like glucose and not much else. Don’t cancer cells feed on glucose? I think the concentration of glucose in tumours is how they are traced on PET scans. Oh dear. I really like it when my sarcastic send-ups of reality are less real. What’s the concern? That your HbA1c will approach “normal”? Can’t have that, now can we? That giant smacking sound you hear? Face into keyboard. Do what a friend did, buy a box of cornflakes and take it to your meeting in a shopping bag. The dietician will beam approvingly. She need never know that you don’t ever eat the contents or indeed take it out of the bag, or that it is the same box you take to your appointments for the next six months . . .
Steve, I think there’s two ways of dealing with the bewildering foolishness of advice to diabetics. First, nod your head politely and ignore everything she says. I’d go for option 2 because there’s just a chance that they might learn something. When the system is widely ignored and begins to feel irrelevant, they’ll change, if only from wounded pride. I’d take a copy of this paper and ask if anyone treating diabetics was interested in science? It shows that you’re not a lone, uninformed maverick. Quite the opposite: you are way in front of a system that makes the Spanish Inquisition look forward thinking and open minded. I heartily endorse the second approach & that’s exactly the article I would recommend. It seems naive to say that patients are the only ones with the power to change the system, but I do think that is the case. Healthcare professionals work for us. They need to understand that we’d appreciate their support and help,but if they can’t treat us like the individuals that we are, we have no other choice but to ignore their advice. When you go to have the tires changed on your vehicle, the shop doesn’t just pull out a generic set of “tire guidelines” and you get some sort of “standard” of tire. Business would quickly disappear if they did that. Is it so radical to suggest that humans might be at least as different as different makes/models of vehicles? Adele, we’re agreed on option 2. I’d like to be lazy and leave things up to brilliant professionals, but somehow in this field they manage to be wrong about most things. That truly is a spectacular failure. Thank goodness for those people who have continued to fight this nonsense. I’ve been discouraged lately at work and this about sums it up. Jennifer Elliot is the Australian dietitian sacked for recommending a low carb diet to diabetics, although the Dietitians Association of Australia (DAA) now deny that. I sent a letter on Elliot’s behalf and got the sort of standard reply one might expect. There was no meaningful comment on the paper on carbohydrate restriction for diabetics that I forwarded (Feinman and Pogozelski et al.) or the Credit Suisse report on ‘Fat: A New Health Paradigm’. “According to Diabetes Australia, very low carbohydrate diets are not recommended for people with diabetes. The organization states: ‘If you eat regular meals and spread your carbohydrate foods evenly throughout the day, you will help maintain your energy levels without causing large rises in your blood glucose levels’ (Diabetes Australia website, 2015). Diabetes Australia recommends people with diabetes eat moderate amounts of carbohydrate and include high-fibre foods that also have a low glycaemic index (GI). . . .
People with diabetes may also be misled by the idea of replacing some carbohydrates with foods high in saturated fat – however, research shows this can actually increase insulin resistance2. •	Butter, cream, cooking margarine, coconut and palm oil. The Australian Dietary Guidelines have been designed for healthy populations and suggest people have from 45%, and up to 65%, of their total energy intake from carbohydrate foods. Isn’t it strange that when they talk about saturated fat it is in the context of biscuits, cakes, pastries, pizza and potato chips? Eggs, meat, milk and cheese don’t get a mention, except that meat is clearly bad. Butter somehow belongs in the same category as ‘cooking margarine’. The disproportionate influence of vegetarians is again evinced. Australians should clearly get rid of all those sheep farms in the arid outback and have a go at growing ‘healthy whole grains’. I wonder how sustainable that would be? As for diabetics, no discouragement at all from eating carbohydrates, but a warning that saturated fat can increase insulin resistance. The sad thing is that Australia has slavishly copied every mistake we’ve made and are ever-so-slowly inching away from. At some point in the future, I suspect they’ll be the last bastion of the low-fat diet. I replied briefly saying that Australians, like people in UK and US, would continue to get fatter and sicker and that the DAA was part of the problem. My US health plan promotes a plant-based diet these days, with near-zero red meat, only small amounts (if any) of poultry/fish, and, of course, near-zero fats of any kind. This hard push against animal protein is quite recent. Perhaps part of yet another global trend? I found the DAA’s nod to “environmental sustainability” (above) most fascinating. Many vegetarians/vegans adopt their ways of eating for environmental reasons, but this is the first time I’ve seen a professional health association cite sustainability as a rationale for (supposedly) health-based recommendations. Must we choose between environmental health measures (that support current corporate practices) and our own personal health measures (that are proven to work)? I suspect we’re being shoved in that direction, regardless of any scientific basis, or lack thereof. Sharon, I don’t believe we have to make a choice between sustainability and health. That paradigm is driven by the evangelical end of vegans and vegetarians. Those Australian sheep farmers I mentioned are producing pretty much the only thing the land can produce that we can eat. It’s highly sustainable meat, but that doesn’t matter to people who don’t eat meat for ethical reasons. I respect those reasons, but I don’t share them. Most people don’t, which is why the movement adds ‘health’ and ‘sustainability’ to its reasons to browbeat people into eating mostly “plant-based food”. I live near a national park in England. It’s beautiful, but much of the land is rocky and the only ‘crop’ that can be grown is sheep. We’ve had sheep here since the Romans and there are 30 sheep for each person living in the national park. Sheep eat grass and provide meat and wool. I’d say that’s highly sustainable. The sheep also roam the countryside, largely unfettered. It’s about as ethical as anything we eat. You could make a similar argument for venison and rabbit. I accept that some meat production can be intensive, corn fed, and unpleasant. I don’t buy that sort of meat. It would be good to hear a vegetarian concede that some meat is completely sustainable and the only practical use of our moorlands and rocky uplands. I spent a few weeks in Iceland this summer. Sheep EVERYWHERE. As Stephen T. said, what are they going to grow there? Grains? Most restaurants had one vegetarian entree (I don’t recall ever seeing a vegan one)–vegetarian lasagna. We joked that it was the same lasagna, one per year, cut up and frozen & shipped all over the island for the tourists who couldn’t bring themselves to eat the loveliest lamb–and most wonderful fish–I’ve ever had anywhere. This is not the first time public health guidance has been a tacit display of progressive middle class values. And it’s not the first time that our failure to shift public health paradigms has cost lives. (The refusal to accept that pellagra was not caused by an infectious agent related to the “poor hygiene” of the lower classes is an example of both of the preceding). And food/dietary strictures have always had strong moral underpinnings. But what we have right now is a perfect storm of progressive ideology, industry interests, professional hubris, scientific disarray, and public confusion mixed with guilt and apathy. It’s a mess. But we are working on it. Round these parts we have marshes and other damp low lying land which was customarily cropped by cows (grass fed beef yum!) and is currently seeing more sheep, as lamb rivals venison in price. Same thing for a different reason, it’s next to impossible to grow crops. This is low input agriculture, the arable and vegetable growing areas require high inputs of diesel, sprays and fertiliser (at least some of the fertiliser is still animal manure which wouldn’t be there without the animals). Just like the uplands this is nature rich land. ISTR several years ago (haven’t looked recently to see if they changed their mind) the WHO decreed that the future population shall eat a high carb low fat grain based vegetarian/vegan diet. This can only occur if the human population is edited (ie. eugenics) to eliminate all diabetics, everyone prone to obesity, etc. I suspect we are seeing this policy in action and they simply haven’t twigged yet (or perhaps they have) that it will require the elimination or a very large minority if not the majority. Chris, you’re quite right. What could be more sustainable than sheep, deer, cows and even rabbits grazing in open fields that are pretty much useless for anything else? No pesticides and little use of machinery. Many people here buy their meat from local butchers who buy from local farms. It’s common practice for the butcher to display a board with the farm’s name and location. It’s usually within walking distance or a short drive. And this is in a city considered poor, not some privileged rural idyll. Of course meat can also be produced in unpleasant industrial settings. This is where consumers can influence the market by buying decently produced meat. Meat eaters have far more influence on producers than vegetarians, who would really like to close the industry down. But first they need to convince us that meat’s unhealthy and unsustainable. This has nothing at all to do with nutrition. I don’t think the DAA or the USDA should mix up environmental issues and nutrition. The DAA should try to get nutrition right, which is well beyond it at the moment. It doesn’t seem to understand that intensive crop production can have an environmental downside and meat can be sustainable. It’s not all good or all bad. I pointed out earlier that we’ve been rearing sheep in our hilly uplands since the Romans. Even if you choose not to eat meat, that’s a pretty good definition of ‘sustainable’. I live in a small market town surrounded by other small market towns. We still have not one but two butchers, who like yours list the farm the animals came from, and not one but two veg shops. This is where you will find the fit healthy old folks. Many of the village shops have now gone but some have been replaced by farm shops. The last dairy farm in the area closed down some years ago, a new one has only recently opened but they have put in a lot of capital to deliver and process the milk themselves rather than sell at a loss to the supermarkets. My mother lived to be 95, a neighbour was 108. There are many octogenarians in the local churchyards going back a century or two. Some of this longevity may be genetic but I suspect most of it is environmental. I doubt any of the fat people in the supermarket buying their Low Fat!!! foods and getting ever fatter will approach these numbers. At one stage they were going to specifically target France “because they were eating too much saturated fat” but actually I suspect because the French Paradox was an embarassment and they wanted to increase French rates of CVD in line with other countries. A few years back the Big Arable farmers were being paid £30 – £50/tonnes LESS than the cost of production for their wheat. This may turn out to be another unprofitable year. I predict this will have no effect on the price of wheat-based foodlike substances, the supermarkets and middlemen will still make their profits which they can’t make on QUALITY fats and proteins, let alone vegetables picked by East European minimum wage or less people. That’s the REAL driver of dietary policy – plus the fact that the drug companies make huge profits providing the antidotes to their diet. Totally agree — draconian “choices” are not based on the real needs of human health OR the environment. But, as we see with the carbs debate — governments, health associations and certain corporations can, and do, combine with dogmatists to make life harder for humans who are concerned for human health AND the environment, and who refuse to sacrifice either one. I belong to a few online support groups for low-carbing diabetics. Such groups serve a vitally needed purpose. I’ll go further, and say they all save lives. Still, far too many of us find that our medical “care teams” are strongly opposed — to the point of sabotage — to our efforts to live long, healthy lives free of complications. While I’m sure most of these professionals mean well, their good intentions are no comfort when our health has been compromised, or damaged outright. Well, the tide is turning. The proof of this is that when I began looking at low carbohydrate diets (my own blood pressure & blood sugar having gone up up up on my low-fat vegetarian diet, home-cooked from whole foods, I might add), I stopped talking to other people about it because of the lectures I would get. Now when I bring it up, invariably I hear stories of friends and family members who successfully manage their diabetes with carbohydrate reduction. I think on-line information and support is central to this shift. The issue with health care teams goes beyond the opposition to any particular dietary intervention, although certainly the opposition to a low-carb diet for treating type 2 diabetes is egregiously wrongheaded. The general hubris, the “I know what’s good for you better than you do” paternalism, the tendency to treat a person like a statistic–that all needs to go. And I think it will, as people have more access to information and options and become better advocates for themselves and their family members. In the meantime, I do think it is important to support and champion those providers who are willing to buck the system in order to offer appropriate care. Doctors/dietitians/nurse practitioners/etc. who support their patients’ personal health journeys–even if those journeys involve carbohydrate reduction–deserve our thanks. Right now, I’m on a health plan that directly hires all clinicians and staff, all of whom must operate under job requirements that are not necessarily friendly to diabetics. Hospital diabetic-plan meals, for example, are all mostly carb with a hint of protein and near-zero fat. My current primary doctor is a true believer in said requirements, so I am looking for someone who can be more reasonable, even if it must be within limits. My complaints are lodged mainly against institutions, not individuals. Hello, I’m not a diabetic and I’m utterly bewildered that doctors are still telling diabetics to eat carbs/glucose. Why on earth would they do that? Is it still the low fat nonsense? I’ve read that that in the UK the low-carb approach is described as “Unproven in the long term.” People feeling better and giving up insulin seems like a better indication that they’re heading in the right direction than an ever-worsening disease and amputations. How is this madness justified? “Why on earth would they do that?” It’s mystifying. This is why I get to write (literally) a dissertation on the reluctance of the paradigm to budge. Agreed – but with the proviso that many (most?) healthcare professionals may face disciplinary action if they are found to deviate from the script. There are a few clueful doctors in the UK who have put their head up above the parapet, there are significantly more who will say “If it works for you, carry on, but of course I can’t recommend it”. I’ve heard not a few times that people’s doctors claim to have been instructed NOT to encourage, or even discuss, other than low fat diets, and of course not to prescribe test strips to non-insulin users, and theoretically any doctor found in possession of well controlled diabetics may face investigation and disciplinary action for “failing to adhere to NICE guidelines/PCT protocols” but don’t know if this has actually occurred. An accounting clerk can easily spot them as the official results are dire – something like under 10% of Type 1s and less than a quarter of Type 2s have A1c below 6.5. You might hope that if doctors themselves become ill they may be tempted to do their own research. One of ours was the size of a small building and claimed that “everybody has to eat carbs or you will have no energy” and that “diabetes is always progressive, it’s the nature of the disease” without making the connection. When she finally became “prediabetic” she lost a lot of weight. I was hoping she had learned about low carb from a patient but no, she was doing 5:2. The likes of you are just “cranks on the internet” – but you’re in good company, so are Ron Krauss, Eric Westman, Jeff Volek, Stephen Phinney . . . Sounds like the beginnings of another blog post: “any doctor found in possession of well controlled diabetics may face investigation and disciplinary action.” As if people who control their blood sugars are some sort of contraband. Which, I supposed, under this paradigm, they are. Well I know for a fact it has happened to doctors who are overenthusiastic about controlling hypothyroid. Some who have broken the Rules by prescribing T3 or Armour have been struck off. the point that he saves MONEY is important! Once there were only a few reseachers into low carb and now an increasing number of people you’ve never heard of before starting from the premise that low fat diets didn’t work and are looking at why and what to do instead are popping up on PubMed. On the other hand The Authorities, backed by Big Food and Big Pharma, are mounting a fightback, look at what has happened to Jennifer Elliott, Tim Noakes, etc. and bloggers who have been forced to “cease and desist” from giving dietary “advice” other than Low Fat of course. Theoretically anyone not eating low fat can be diagnosed with Orthorexia. I’m not sure that significantly improving your health is a defence against this diagnosis. The remaining diabetics who have failed to progress since they were originally given low carb diets way back when are now dying of old age, not diabetic complications. Same for people old enough to remember BEFORE low fat, when there were no “epidemics” of metabolic diseases. Someone should be studying them before they are all gone, not inventing new “psychiatric” diagnoses. Man. I was educated back when diabetics were actually educated to lower their carbs. Berries, not apples and bananas. Meats and fish, not bread. What has happened to the nutrition and medical establishment in the past 30+ years is criminal. And, while I see how ludicrous the situation is, I want to start marching to protest the tragic death and dismemberment of so many, the terrible mental stress on little kids and their parents dealing with T1. What might wake a few idiots up, and I mean this quite sincerely, is if the relatives of those killed by the advice they were given filed wrongful death lawsuits against the ADA, against their doctors, against organized “nutrition” in this country. Laugh? Cry? Both are apt. Unfortunately, part of the puzzle I’m trying to untangle includes not only a shift to low-fat diet recommendations, but a shift to having individuals assume full responsibility for their own health outcomes. This means that as we increasingly placed the responsibility for limiting harmful “lifestyle” exposures on the individual, we increased environmental levels of a fairly harmful exposure, namely “preventive” health recommendations that have little to do with individuals. And thus, people who have diabetes blame themselves–and sometimes their family members blame them as well–for not “trying harder” or “doing more” or “eating less,” when the advice they’ve been given is simply not suited for them. They don’t blame the ADA because they feel they are the ones at fault. See, “cry,” right? LOL “your diabetes hasn’t progressed at all” !!! I’m a T2 in the USA. I just got my latest A1c — 5.4. This was followed by a scolding from my doc, who says my A1c *should* be 7.0-7.9. Low-carb, high-fat *plus* insulin are my tickets to The 5% Club. If I cut either one, I get to join The 10% Club … or higher. Naturally, he now threatens to take me off of insulin, and he urges me to enjoy “healthy” whole grains and fruit. The USA is a mixed bag. Not all docs or health plans are *that* bad. If you decide to move here — beware! Good grief. As a number of my readers–all both of them–may attest, sometimes medication is necessary to control blood sugars. Nothing wrong with that. But–as you’ve so clearly pointed out–that doesn’t mean that reducing carbs won’t also help keep blood sugar swings under control. What happened to treating patients like the individuals that they are? Congrats for being in the 5% club & I hope that you’ll always be able to find a physician who will help you stay there. Thanks for your support of those of us with diabetes. Doctors are fearful of hypoglycemia and become unhinged when someone gets below 6.0% as they are afraid you will have to go to the hospital. Low carb/high fat is the way to go and really reduces the amount of insulin you will need. I needed to change doctors when my endocrinologist wanted me to get an A1c above 7.5% (actually ordered me to). The CDE, RD in the office was none too polite when she said I needed to eat whole grains and more carbohydrates with less fat. Of course I blew that advice off and said I will do what works for me. As we age, we do have to become more careful, but as long as we are good in cognition and can make valid decisions, we need to keep diabetes at bay and do what works for us. What we know about A1c is that “lower is better” in terms of long term health outcomes. I can’t for the life of me think of a single reason why you would want someone to have a HIGHER A1c. In type 2 diabetes, food does not cause hypoglycemia. Just meds. If the doc is concerned about hypos, wouldn’t it be the meds that need changing–not the food? Sigh. When I worked with Dr. Eric Westman at the Duke Lifestyle Clinic, he was fairly tolerant of higher A1cs as patients acclimated to a low-carb diet. Rather than over-medicate and run the risk of hypos, he would reduce the diabetes medications so that patients could figure out just how much control they could achieve with diet, and then add back in meds as needed. Not, let’s just dump the meds in there and add back in carbs so you don’t go too low. A different set of values at work. In a word – ACCORD. When this was published, UK NHS doctors were instructed not to use “intensive treatment” to reduce A1c below 6.5. This has been interpreted as “stop patients from normalising their A1c at all costs” and many patients have been told to INCREASE it, some have been threatened that treatment will be stopped or that their doctors will drop them unless they comply. Currently many well-controlled diabetics have been deregistered and told they are “no longer diabetic” or “were never diabetic” and stunningly this includes some Type 1/insulin dependent diabetics. Statistics trump health, obviously. No-one has heard of the later reanalyses of the ACCORD data, let alone EPIC-Norfolk or the huge New Zealand study that relates A1c to cardiovascular risk. Well not “officially”. There’s an increasingly huge gap between “evidence-based” medicine and the actual evidence, let alone what patients actually DO. Even for those of us on insulin, it is best used in conjunction with low-carb. This actually insures against lows, because we’re not always trying to hit a moving target between spikes and lows. Carb count alone cannot ever be 100% precise (or anywhere near it). A slight miscalculation, a small recipe change unbeknownst to us — plus, for many of us, non-food factors such as stress, infection, quality of sleep, even the weather — can/will thwart the best effort to “cover” carbs with insulin. Not to mention (if you believe Dr. Fung) that insulin causes insulin resistance. So, the more insulin you take, the more insulin resistance you have. It’s a vicious cycle. Or some of his videos. He also believes more than just carbs go into insulin resistance, such as stress. Dear diabetics, keep doing what your diabetes educators and your doctors tell you to do (like my husband did) and you can end up just like him… dead at 51. Oh wow. I’m so sorry. And I’m even sorrier that this is probably not an uncommon situation. On some level, it may be a tacit recognition of the liability inherent in shifting paradigms that keeps the paradigm from shifting. Thanks! If we couldn’t laugh, we would all go as insane as these ridiculous policies are (apologies to Jimmy Buffett). Adele, this sounds just like the conversation my mate, Margaret, had with her doctor yesterday. But she knows better. She told her doctor, absolutely no statins. Good for her. There’s nothing wrong with medication per se (I say as someone who has had migraines all my life, although greatly reduced in number with reduced carbs). But I don’t get the whole “take this for the rest of your life–just in case” thing. Adele – please keep skewering them. Thanks for posting this – too many people with agendas running healthcare. While Australia is the goat now, never let your eyes forget to keep a focus on our own country. Jennifer, it takes an awful lot to drag me out of my cave of books, but if there’s anything that deserves my attention it’s this. Thanks for the kind words & keep your chin up. I know having integrity instead of a job might not be terribly satisfying. I hate that you had to be the “poster child” for our current version of nutrition screwed-upedness & I admire your courage. We’ll keep at it until it changes. I wish you luck. Something similar is also happening in South Africa to Tim Noakes. They couldn’t fire him, though. Yes, I am watching that unfold with great interest. I love the authentic Oz speak, and while this wouldn’t prevent me from moving to NSW (since it’s an amazing part of the world), it might prevent me from seeing a dietitian while I’m there. Ha! This is great! I love good sarcasm! So true. When you put actual real live people into these “public health” paradigms the absurdity is all too clear–and heartbreaking. So great to have you back, Adele. You are a guiding light. Government control of DGA MUST be terminated. WE all are with you. Meanwhile, study hard and stay strong. Thanks. The support of my friends (in person and on the interwebz) & my husband’s coffee keep me going. It’s good to see you back in action! I’m beginning to think that social media might cause a fundamental shift in how some of these policies are created. If many people email or post their successes with a particular diet (regardless of what it is), that may sway the powers that be (let’s hope, anyway). For instance, the American Diabetes Association posted the seemingly innocuous statement of “What was your most recent blood glucose reading?” In response, they received many, many comments saying the diet prescribed by the ADA was completely wrong (or “dangerous”) for diabetics and the posters were instead following the diet advocated by Dr. Bernstein, who favors low carbohydrate diets. When you have many (hundreds?) of posts saying your diet is wrong or potentially dangerous, perhaps someone will listen (even if it’s only the college student assigned to review the posts). Perhaps if enough of us email the Dietitians Association of Australia, we’ll get some change. Or maybe not. Don’t hold your breath waiting! Believe it or not the ADA Forum (when I used to read it) was wall to wall low carb success stories, and had been for a decade or more, as are most but not all diabetes forums/newsgroups/blogs. When John Buse was in charge back in 2008 it looked like he had noticed, they began to say that perhaps low carb diets weren’t so bad as long as you NEVER went below 135g carbs and only did it for a year, and only for weight loss, not BG control. The result was that some of their oldest sponsors pulled their money. Buse wasn’t there long and since then there has been little or no change in their recommendations except it’s harder to find the actual details. However they don’t appear to have lost any more sponsors. Superb! There really is no end to idiots in the disease care system. We’re on to ’em, though. Thanks! Yes, there does seem to be an endless supply of ridiculousness for me to skewer. Will the real Dietary Guidelines please stand up?